Camp Registration is live! 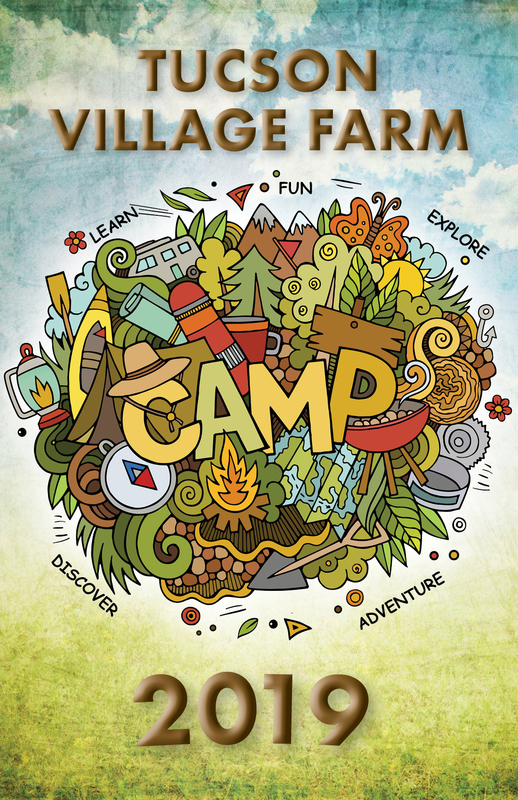 Send your child to a Tucson Village Farm Camp! Here are some of our camp FAQs. Walk in Registration: Stop by Tucson Village Farm from 7:30-4:30 M-F. There are registration forms at the front desk for you to complete. You can also download them, print and bring in. The forms can be found here. All of our camps include delicious healthy meals and snacks. You don’t need to send your child with anything but a hat, water bottle and sense of adventure. With the exception of 4-H Adventure Camp, since it is an overnight camp you will receive a packing list for your camper(s). Yes, we have camp scholarships. We will start our spring camp scholarship campaign soon, the number of scholarships and partial scholarships is based on our fundraising efforts. Click here for an application for scholarships. For 2019 we have 9 camps for ages 4-14. Please see listings below. If you have any questions about camp please email or call Kalee Hunter 626-5161. Do you need a copy of our Camp brochure to share with your friends? Click here to download a copy! Sprouts Camp is the perfect camp for exposing your little one to science, gardening, environmental stewardship, and healthy eating, all through fun farm activities! Campers will spend the morning hours exploring the farm and helping us with daily farm chores, like harvesting, planting, feeding the chickens, and checking on the worms. To beat the heat, campers will move indoors to learn how to prepare healthy snacks with veggies from our own gardens and for farm arts and crafts. At First Farmers, campers will explore everything that the farm has to offer. From planting seeds, harvesting potatoes and caring for chickens to spending time in the kitchen creating a simple delicious lunch with fresh farm produce, campers will participate in a full farm-to-table experience! Due to popular demand, we will be hosting TWO weeks of 4-H Adventure Camp this year. 4-H Adventure Camp is the quintessential summer camp experience! Join us on our annual expedition to Prescott, Arizona where we’ll explore the highlands, marvel at mother nature and ponder the ponderosa pines on Mingus Mountain. We will be offering a huge variety of fun camp activities based on 3 different age levels, including hiking, fishing, lake swimming (with a slide! ), games, campfires and more! Getting to camp: There are two ways to get your camper to Mingus Mountain. A. You can drop them off Monday at noon and pick them up Friday at 11:30. Or B. The bus which costs $45 each way. The bus will leave Tucson Village Farm at 8:00 on Monday and return at 5pm on Friday. We a limited number of spots. They will sell fast. Once they are sold, they are gone. If you like good food and good fun, join Farm to Fork Culinary Camp: Budding Chefs where campers get delicious and educational farm-to-table cooking experiences! Campers will harvest from TVF's bountiful summer garden and bring that produce right into the kitchen. They will learn a variety of essential culinary skills and techniques through hands-on lessons and demonstrations. But that’s not all! Visits from guest chefs and special lessons on the science of cooking will be the “icing on the cake”! This year TVF is excited to be introducing a brand NEW cooking camp: Farm to Table Culinary Camp: Master Chefs! This camp will feature our outrageously popular Iron Chef competition and our beloved farm-to-table cooking lessons. Campers will be challenged to attempt more difficult culinary endeavors and tackle more advanced recipes. Our hands-on cooking lessons will encourage campers to use both their technical understanding of cooking and their own personal creativity to create healthy, mouth-watering meals! This camp is perfect for veterans of our original Farm Flay-Vahs camps and for students with an existing knowledge of kitchen basics. Campers will receive Community Emergency Response Team training concentrated on learning skills in the following areas: disaster preparedness, fire safety & suppression, disaster medical operation, treatment of injuries, search and rescue, disaster psychology, and more! Not only will the "MyPI" camp allow youth members to build life-saving skill sets, be able to identify hazards, develop emergency kits and communication plans, but also give back to their communities through the "MyPI" service project! At the end of the week, campers will leave with more knowledge as well as CPR and AED Certification. Calling animal-lovers near and far! Join us in our very first camp devoted ENTIRELY to the animals on a farm. In the morning campers will get up close and personal with all types of farm animals, learning the ins and outs of best-practice livestock care. When the day heats up, campers will move indoors for hands-on educational lessons, Q&A sessions with livestock professionals, and educational animal care video lessons. If your camper loves farm animals or aspires to raise them one day, they won’t want to miss this camp! Art in the Garden is designed to cultivate creativity and love for nature. This camp will allow kids to learn basic art skills through drawing, painting, photography, and craft making using the farm for inspiration and materials, and to create something beautiful for our garden. Guest artists from the Tucson community will come to teach participants to be young artists and environmental stewards. Campers will wrap up the camp with an art show to exhibit all they’ve created.